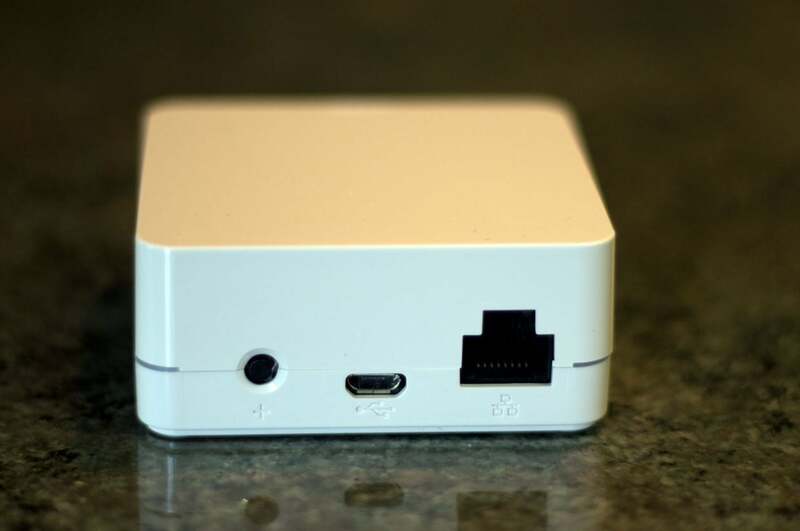 Hands-on review: Who makes the better HomeKit hub? It’s far from perfect, but it’s a more complete solution than what the competition offers for now. Who makes the better HomeKit hub? Lutron is as much of a graybeard in the lighting-control industry as Insteon is in the connected-home space. The company invented one of the first wireless networked lighting-control systems; but until recently, it had only very high-end solutions to offer consumers. Like Insteon, Lutron modified an existing lighting control system—the Caseta Wireless Smart Bridge—to build a HomeKit-compatible version: the Caseta Wireless Smart Bridge Pro. The Smart Bridge, which has a white LED running around its midsection, is smaller than a deck of cards and is powered by a wall-wart AC adapter. 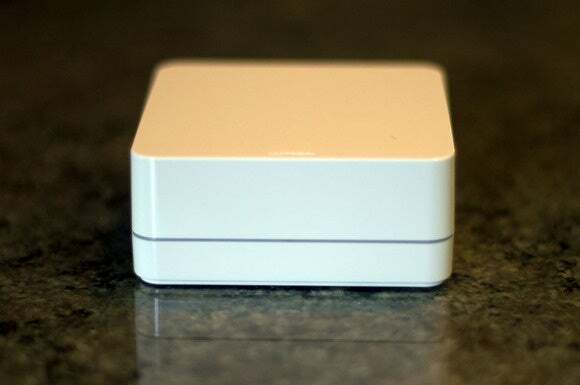 It connects to your router via an Ethernet cable, and communicates with Lutron lighting controls and motorized window shades using Lutron’s proprietary Clear Connect wireless technology, which operates in the same spectrum as devices such as motion sensors, garage-door openers, and security keyfobs. Lutron sent one plug-in dimmer module and one in-wall dimmer switch for me to test, but I didn’t have enough time to hard-wire the in-wall unit. Both devices come with wafer-thin, 5-button Pico remote controls that let you turn the controlled light on and off and dim or brighten the bulb. You can program the fifth button to a preferred light level (it defaults to 50-percent brightness). Lutron offers several accessories for the Pico remote, including a tabletop pedestal, a wall-plate bracket, and a visor clip (so you can use it in your car). Lutron's Caseta Wireless Smart Bridge Pro has just a USB port to connect its power supply, and an Ethernet port so you connect it to your router. The plug-in module has two two-pronged receptacles, one on either side, and can support up to two dimmable LED or compact fluorescent bulbs (up to 100 watts), or two dimmable incandescent or halogen bulbs (up to 300 watts). It has four buttons on its face: On, off, brighten, and dim, but you can’t control the two lights independently. Lutron Caseta bridges now work with Amazon's Echo hardware. Click here for the details. Unlike Insteon, Lutron’s bridge enables you to control window shades (Lutron’s battery-operated models) and a thermostat (either a Honeywell Wi-Fi thermostat or a Nest Learning thermostat) in addition to lighting controls. I didn’t test any of those products, however, and there currently aren’t any other HomeKit devices available. The Lutron bridge also supports geofencing, which means it can trigger events as you leave or arrive home—provided you have your smartphone with you. Lutron’s in-the-box documentation consists of a half sheet illustrating how to connect the smart Bridge to power and to your router. Step two instructs you to download the app from the Google Play store or the Apple App store. Yep, you can use an Android device to control this HomeKit bridge (I tested it both with an iPod touch and an Android smartphone). Lutron's plug-in modules have receptacles on both sides, so you can control two lamps (although not independently). When you add a device to the bridge, you select it from a list and then Lutron’s app displays an animation to illustrate the process. 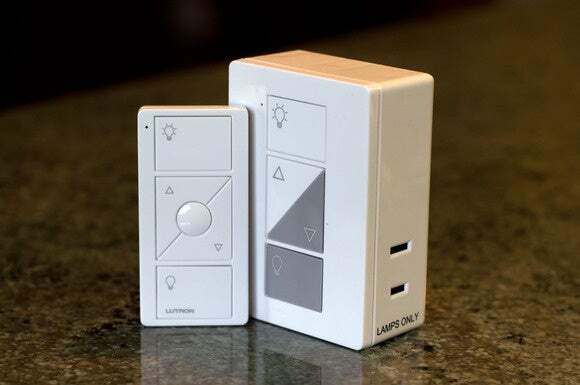 With a plug-in module, in-wall dimmer, or Pico remote, an animated hand moves over a button and indicates you should hold it down for 10 seconds or until its LED begins to blink rapidly. The app will then display a message indicating whether or not the device has been successfully enrolled into the bridge. You assign one name to each device you add, plus an icon from Lutron’s very limited selection (one table lamp, a pair of table lamps, two types of light stands, a desk lamp, and holiday lighting). All Pico remotes are assigned the same icon and you can’t change it (but you can change the device that the remote controls). I didn’t encounter any installation hiccups with Lutron’s bridge; then again, I enrolled only two devices: A dimmer module and a Pico remote. But there were many occasions when I would activate the Lutron app on my device, and there would be a one- to two-second delay with the message “starting up” displayed (the Android app reported “connecting to bridge”). Insteon’s app, to its credit, didn’t exhibit this behavior, but Lutron’s app doesn’t make you tap any icons to access your devices—icons for those and for any scenes you’ve created are displayed right on its homepage—so the wait time to perform an action is about the same with both. If you have a complex setup, you can choose which devices and scenes appear on the home screen. What’s even better is that you can add scenes to an iOS Today widget or Android notification drawer, so you don’t even need to launch the app to set a lighting scene—just swipe down from the top and tap it (you can also create other Android widgets for scene controls). Lutron’s Caseta taxonomy has you group devices into Rooms, and groups of rooms into Zones, so that you can tell Siri something like “turn off the downstairs lights.” But Lutron’s app doesn’t display this organization unless you drill down into its Siri Integration menu. Lutron instead lumps all lighting and window-shade controls under the heading of Lights & Shades on its home screen, where there’s only enough room for four icons for devices and four icons for scenes, because one-third its area is consumed by a functionless photo of a room that’s not even from your home. If you want to see more of either, you must tap the More button. 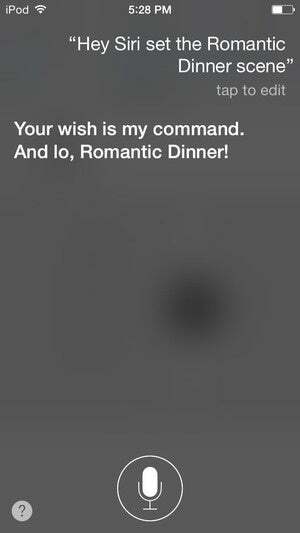 It's fun to have Siri control your lighting, provided she understands what you're asking her to do. 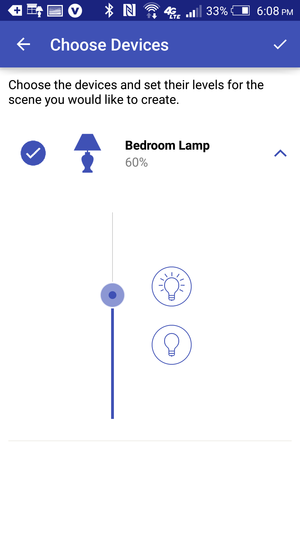 As with Insteon’s app, scenes let you set lighting and window-shade controls to pre-defined values (on, off, 50-percent brightness, open, closed, etc.) that can be recalled at the touch of an icon or with a Siri command (read the introduction to this roundup for a more in-depth discussion of Siri). As I did with the Insteon hub, I created a scene labeled “Romantic Dinner” that dimmed the controlled lamp to 40 percent brightness. You can create as many scenes using as many devices as you want, but you must select each individual device that you want to include in the scene—you can’t enroll an entire room or zone. Scenes can also be scheduled to occur automatically, and Lutron’s app is slightly more sophisticated than Insteon’s on this count. You can schedule a scene to occur on any combination of days of the week (every day, only on Mondays, Tuesdays, and Thursdays, and so on). Scenes can occur at either a specific time of day (lights on at 8:30 PM for instance), or you can tie them to sunset or sunrise (you can even set the time to a number of minutes before or after sunset/sunrise). 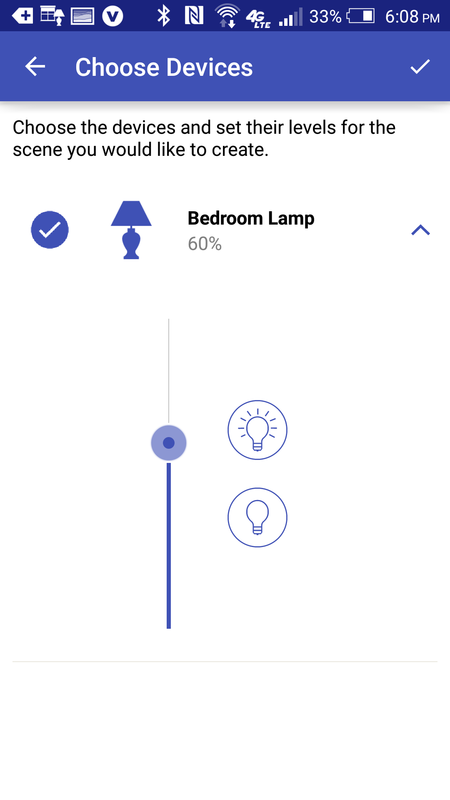 An element of time randomization would give your home an even more lived-in look while you’re at work or on vacation, and I’ve seen systems that do that, but Lutron’s app is pretty good. As I said in my Insteon review, it might seem backward to discuss the whole Caseta taxonomy before getting into how you control individual devices, but it’s important to understand how the system is organized. As I mentioned earlier, the Lutron app’s home screen displays up to four devices and four scenes. Click on the device’s icon and an overlay screen appears with three controls: On, off, and a slider for adjusting brightness (if it's a dimmer you're controlling). The icon for any device that’s powered on will appear on a solid background, and if a scene is currently active, that will be reflected by a filled-in icon in the Scenes area of the user interface. Lutron's touch-screen app is very similar to Insteon's when it comes to controlling individual devices. If you use a Siri command or the Pico remote to control a device, whatever changes you make with it will be automatically reflected in the app. That’s pretty slick. What’s not so slick is waiting for the app to reconnect to the bridge. That process took as many as eight seconds from launch, and as many as five seconds when waking the iPod from sleep. In many situations, it will be quicker to walk across the room to flip a physical switch. Should you buy Lutron’s HomeKit bridge? If you’ve already invested in the Insteon ecosystem, you might save money buying its Smart Hub Pro (just know that some of your hardware might not work with it). If you’re starting from scratch, Lutron has a slightly superior solution. Its hardware is of higher quality, there’s support for smart thermostats, and you can add motorized window shades—a feature that’s particularly great for home theaters. The Pico remote is very cool, too. It’s very early days for Apple's HomeKit technology, but if you’re ready to take the plunge, Lutron's Caseta system is slightly better than Insteon's Smart Hub Pro.